It’s the weekend at the BB Naija House and Saturday, Day 34 was a day to count rewards accumulated in the week for the housemates. It was also a time to question how the housemates felt for each other or rather what Anto really feels for Tolu. These are the highlights of Day 34 in the BB Naija House. Lolu has been courting Anto for Bridget knows how long and the girl doesn’t seem to have buttons to press. The oga did get away with a kiss but we can’t say much about it as it seems she was giving Lolu the white flag just to avoiding giving it to K.Brule. If the feelings between these two were a portrait, Anto’s would be without shape or form, a Genesis to absolutely nothing. Lolu doesn’t see it that way though because his advances have been met with a residue of hope. When Ekuka asked Anto about her relationship with Lolu, she dully gave a somewhat positive answer, saying that something could happen. Like a napkin stained by egusi and yam residue, Anto’s paper light hope marked Lolu, again. The most interesting part of this love limbo was definitely yesterday’s ‘bedtime gist’. Lolu brought out his feather-soft guns and hoped to get a reaction out of Anto but with the amount of shade she threw, it’s a good thing the sun had long set. He asked if there was any hope at all of them becoming a thing; explaining just how uneasy uncertainty leaves him. Anto seems to have filed and archived all the responses she would need to brush Lolu off because she quickly pulled out her classic ‘eggs in basket’ response. To further elaborate her lowkey rejection, she told him that she was and we quote “… one for all and all for none”; also mentioning that he had competition as other hopefuls kept sending her their resumes and sooner or later, she would respond because ‘someone’ kept directing her to look at ‘other options’. Lolu was definitely interested in finding out who those hopefuls were but Anto wouldn’t budge, she simply told him that she couldn’t reveal who it was and encouraged him to keep fighting. Air punching invisible player 2 maybe? To serve it plainly with a dash of assumption, Anto is not into Lolu, at least not in ‘that’ way but, should he survive tomorrow’s chopping board, Anto would have to replenish her excuse archive because it doesn’t look like he’s giving up anytime soon. It is a ritual in the Big Brother Naija House that on Friday nights, Housemates get to take part to the highly competitive Arena Games. For Housemates, after one last adrenaline pump, Friday nights have ushered in the weekend leading to the Live Shows.With a prize as an added incentive, Housemates have always given their best to the Games as they leave the Arena all sweaty and excited from getting their blood running so fast. This week the winner was Ahneeka who was overjoyed to have finally won her first prize since entering the House. Everyone was surprised though they warmly cheered her and acknowledged her efforts. As her teammate, Angel was inevitably ecstatic about Ahneeka’s win for it meant that he too would benefit from it. He couldn’t contain himself as the pride in his eyes for the woman he really fancied was obvious for all to see. When the time came for their recompense, Ahneeka and Angel walked up to the bedroom where two massage tables had been laid out for them. Wearing a pair of skimpy jeans shorts, Ahneeka removed her t-shirt and buried her head in the table ready to fully enjoy the reward. Angel waited for her to be in full massage position to then remove his tracksuit bottom and lie on the adjacent massage table. Yet he couldn’t help and cheekily started groaning loudly, which alerted the other Housemates who came running up to the bedroom, only to find both of them receiving massages on their well-oiled backs. A general hilarity ensued, as Housemates stood there enviously watching and wishing they too were receiving massages. Later, Ahneeka and Angel emerged from this very special treat looking all refreshed and relaxed, which didn’t go unnoticed by Rico Swavey as he poked Ahneeka that she looked like she was on another planet. The Pepsi challenge has finally come to an end and after a tiresome of dancing, the Housemates sure deserve a treat and boy did Pepsi deliver. Knowing that they’d forcefully Wagered a hundred percent of the grocery allowance and how much Tasks contributed to their eventual wins; Housemates were full force into the game and left nothing to chance. The challenge did rub some of them off the wrong way though because the stereo went boom at any time, day or not and they were therefore deprived of sleep. This kind of reminds us of the baby challenge, their worst nightmare. Slightly half way through the week, there were some quarrels surrounding their approach. Housemates were literally displaced and repositioned themselves strategically around the mats; with some earning points on merit and others almost cheating their ways to higher tallies. The Housemates eventually decided to collaborate their efforts in order to avoid injury only to have Big Brother ounce the amazing prizes which include an all-expenses paid VVIP trip to the One Africa Music fest in London and 5 million Naira Cash. This eventuality almost changed their synchronized course as some Housemates felt like they were expected to sacrifice their chances of winning in order to accommodate the losers however, on HoH Tobi’s command, they continued in that fashion. The last day finally came and the Housemates were freed from dance prison and were rewarded barbeque treats for their efforts. Though the challenge bore a few lumps of drama that resulted in quarrels, the Housemates fully enjoyed and like us, anticipate the big announcement. After an eventful week placed under the theme of Nigerian art and music, Housemates dressed up for a very special party placed under the magic of Nigerian acclaimed DJ Neptune. The guys and girls in the House were fitted with the good old school outfits reminiscent of the seventies and eighties. Their attires were a feast for the eyes: the combination of colourful bell bottom pants, flamboyant colours, flashy patterns, platform shoes and flared sleeves topped with larger-than-life wigs made for a captivating moment. No dress is ever complete without the finishing touch that accessories bring, and they literally stole the show: from Alex’s oversized hoops earrings, to Nina and Anto’s white socks tucked into sandals, to Ahneeka matching her hair turban to her shirt, the House had been transformed into a time capsule for a night. We have to say that even the guys and their bling with suspenders and berets took our breath away. 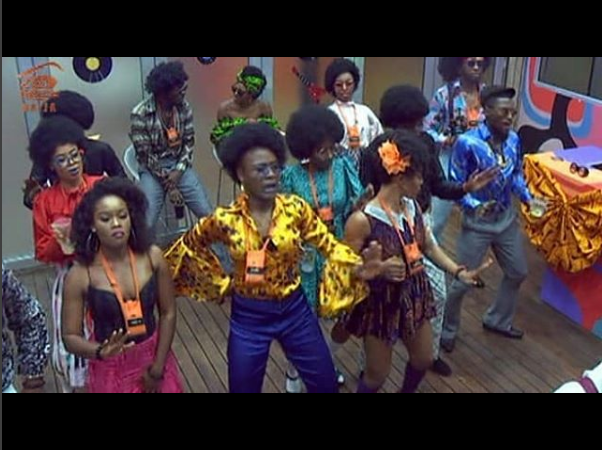 As soon as DJ Neptune worked his magic, Housemates needed no persuading to glide onto the dancefloor to the frenzied African music: from West African hits to East African classics and Southern African beats with North African rhythms, Africa took the centre stage on the BBNaija dancefloor. With a glass firmly in hand, Housemates were joyfully swaying and sweating and shaking every cell of their bodies. Surely this party will remain in the BBNaija history and in Housemates’minds for many years to come.